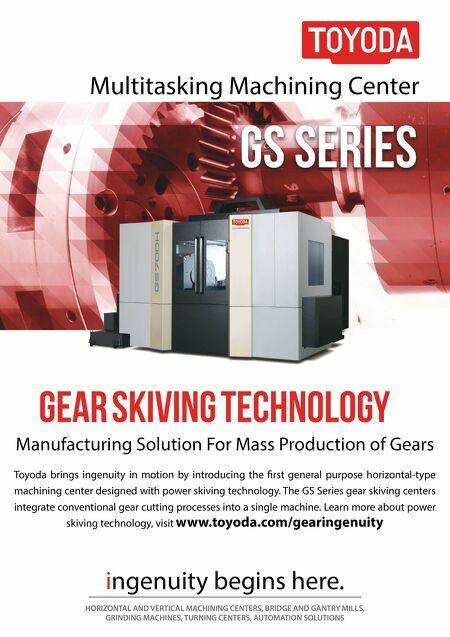 106 MMS November 2017 mmsonline.com BETTER PRODUCTION Shops Using Technology NAPOLEON MACHINE PROBLEM Shop required new equipment to successfully compete in large-parts machining SOLUTION Toyoda LB63324M vertical bridge mill with right-angle head RESULTS Increased quoted job wins from 6 to 52 percent S ometimes, remaking an old job shop into a succe s s re quire s sta r ting f rom scratch. 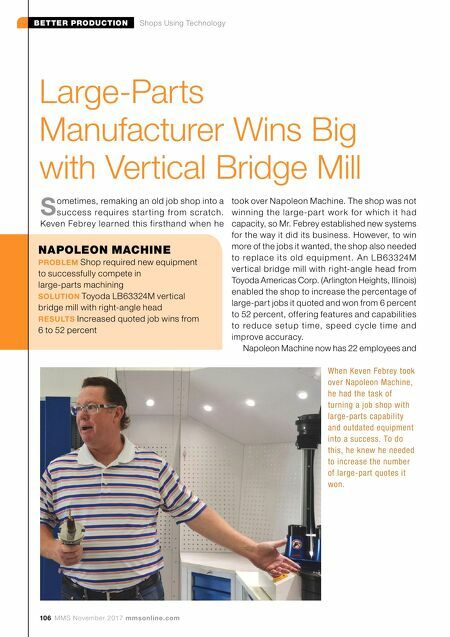 Keven Febrey learned this firsthand when he Large-Parts Manufacturer Wins Big with Vertical Bridge Mill took over Napoleon Machine. The shop was not winning the large-par t work for which it had capacity, so Mr. Febrey established new systems for the way it did its business. However, to win more of the jobs it wanted, the shop also needed to re place its old e quipme nt. A n LB63324M ver tical bridge mill with right-angle head from Toyoda Americas Corp. (Arlington Heights, Illinois) enabled the shop to increase the percentage of large-part jobs it quoted and won from 6 percent to 52 percent, offering features and capabilities to re duc e setup time, spe e d cycle time a nd improve accuracy. Napoleon Machine now has 22 employees and When Keven Febrey took over Napoleon Machine, he had the task of turning a job shop with large-parts capability and outdated equipment into a success. To do this, he knew he needed to increase the number of large-part quotes it won.